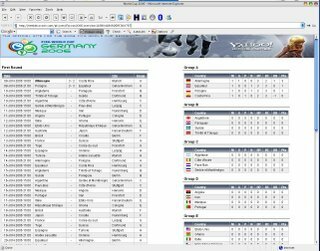 I received a nice Excel file which can store the scores of the World Cup 2006. As I really love APEX, I thought, let me try to make this "advanced Excel" in APEX. You can update the scores of the games, all the rest is "automatically" (till the 1/8 finales). 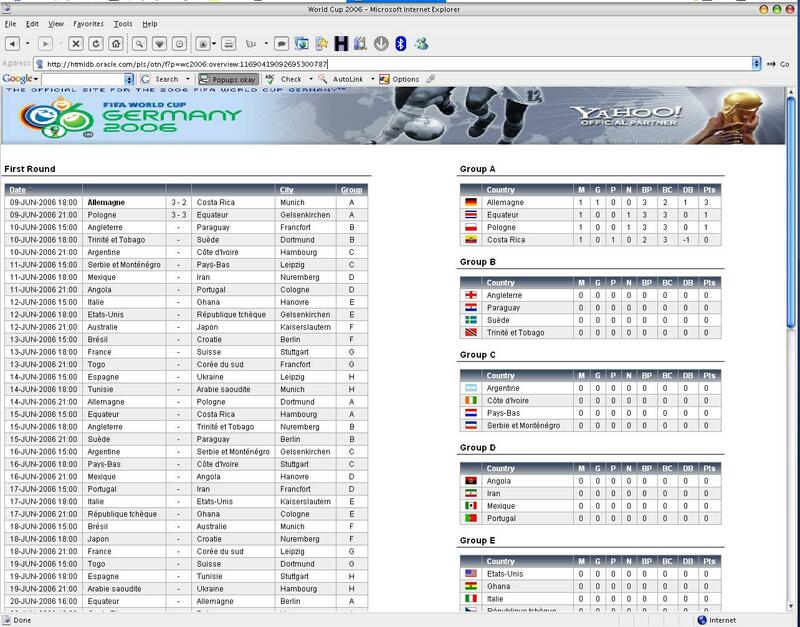 Basically you have two procedures to calculate the score and to show the flags, and two pages, one to show the results and one to fill in the score of the games. I also made a third page, to upload the flags (little jpegs) into a blob column. There's still room for improvement; table layout, add fk's, items/regions definition, add automatically calculation for the 1/4 finales and further, improve code etc. You're free to download the source here. 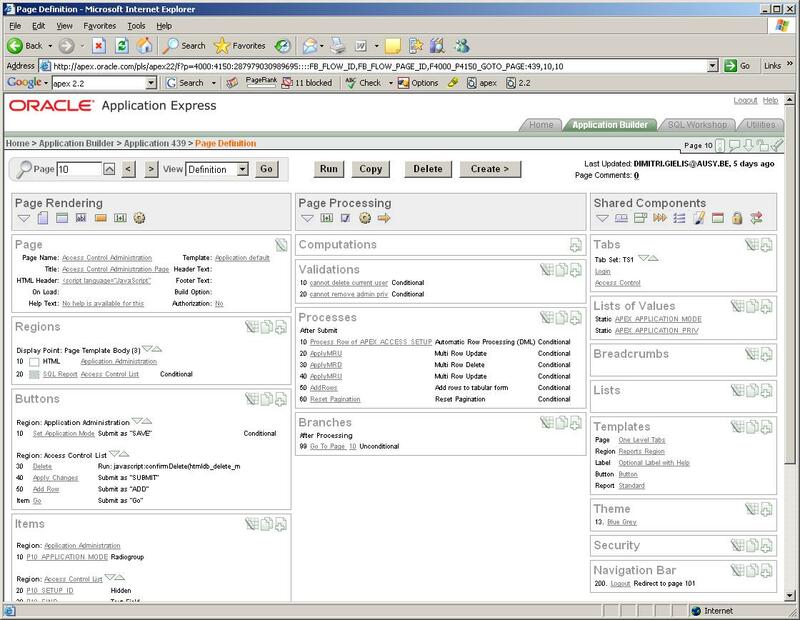 It includes the generation of the tables, the data and the APEX application. As like on other days, I was reading Orablogs. But this day will be kept in my memory! Suddenly I saw the post of Sergio, talking about me and my blog. First I couldn't believe it... but then I looked at my stats of my blog and I saw a hugh increase in visitors! 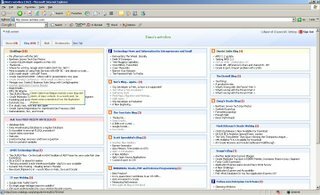 I really look up to the posters of Orablogs... especially I'm reading the blogs of Tom Kyte, Sergio Leunissen, Scott Spendolini, Doug Burns, Sue Harper and some others (see the rss feeds on the picture). Seeing myself in one of their posts gave me a warm and pleasant feeling. Although I posted the previous post about APEX 2.2 today, the date is kept from the moment I saved it as "Draft". After I requested an APEX 2.2 workspace, I was curious to see what had been improved. ODTUG Kaleidoscope 2006 - Clarifying the Developer's Changing Universe is the Premier Conference for Developers Working with an Oracle Database. Next to the interesting topics and the nice people I will meet, I'm also looking forward visiting the United States for the first time... 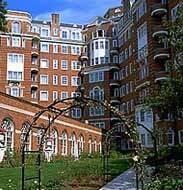 I'm staying in the Wardman Park Marriott Hotel (see picture). This is also the hotel where the conference is organised. 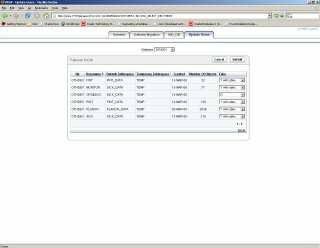 Oracle DB - difference in chars and charset 8i - 9i?! 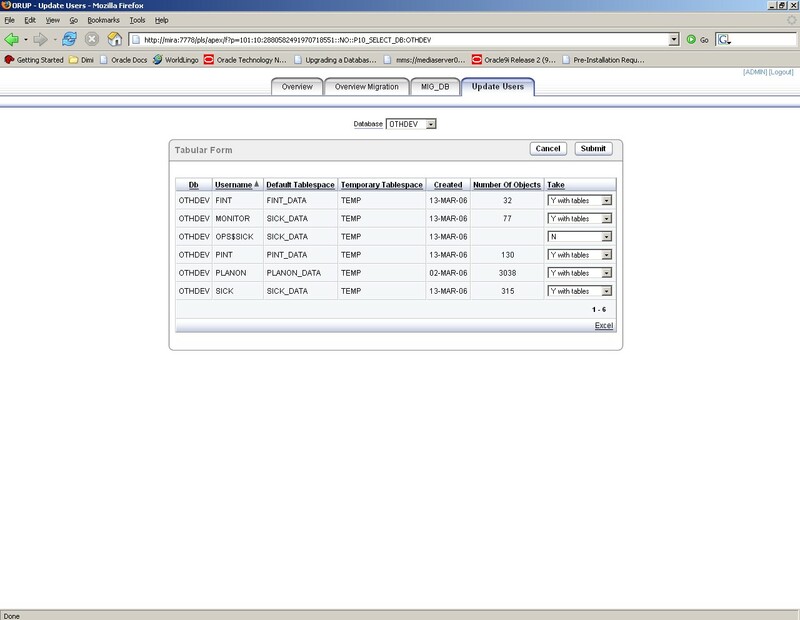 First time I see this behavior of the Oracle Database... Although when you think about it, I can understand the 8i -> 9i behavior, but the other way around?! 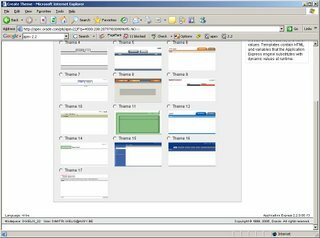 What happens when you do the create table? So you can see that the initial data/char length is multiplied by 3 in both cases! I suppose because charset UTF8 can have 3 bytes per character and WE8ISO8859P1 has only 1 byte per character. The Solution to copy the table? You may try yourselves... Download my test script here. As I do it for the x time, I’m working on “auto-pilot”. "CREATE TABLE "D_JOB" ("O_ID" NUMBER(10, 0), "D_TITLE" VARCHAR2(250), "D_OUTPUT" CLOB, "D_PERCENTAGE" NUMBER(10, 0), "D_LASTUPDATE" NUMBER(10, 0), "D_OWNER" NUMBER(10, 0), "D_STATUS" VARCHAR2(20), "D_PRIORITY" NUMBER(10, 0), "D_TYPE" VARCHAR2(20), "D_TIME" VARCHAR2(5), "D_DATE" DATE, "D_CLASS" VARCHAR2(250)) PCTFREE 10 PCTUSED 40 INITRANS 1 MAXTRANS 255 LOGGING STORAGE(INITIAL 32768 NEXT 32768 MINEXTENTS 1 MAXEXTENTS 4096 PCTINCREASE 0 FREELISTS 1 FREELIST GROUPS 1 BUFFER_POOL DEFAULT) TABLESPACE "TOOLS_DATA" LOB ("D_OUTPUT") STORE AS (TABLESPACE "TOOLS_DATA" ENABLE STORAGE IN ROW CHUNK 8192 PCTVERSION 10 NOCACHE STORAGE(INITIAL 32768 NEXT 32768 MINEXTENTS 1 MAXEXTENTS 4096 PCTINCREASE 0 FREELISTS 1 FREELIST GROUPS 1 BUFFER_POOL DEFAULT))"
Almost all tables were imported fine, but the tables with some CLOB’s in weren’t! As I changed the default tablespace of the user (and the old tablespace didn’t exist anymore) the import couldn’t find the tablespace and gave the above error. I suppose I forgot that if you’ve tables with clobs in, the default tablespace of the user isn’t automatically taken… to solve the problem, I had to recreate the tables manually with the right storage clause (tablespace). 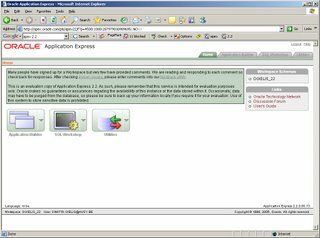 Although my current mission has nothing to do with APEX (Application Express - old name is HTMLDB) I use it almost every day at the customer! My current mission exists out of two parts: the first part is helping the DBA's with the support of the existing environments, the second part exists out of doing upgrades (8i to 9i), migrations and reorganization/clean-up of most of their databases (for DEV, TEST and LIVE). You may see it as a "typical" (long term) DBA mission. 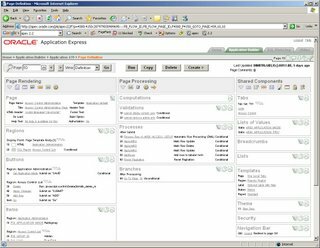 This customer is using a lot of Excel files for the overview of the environment and especially for the planning of the database upgrades. Although they've today mainly 8.1.7 databases I saw the opportunity to promote APEX. 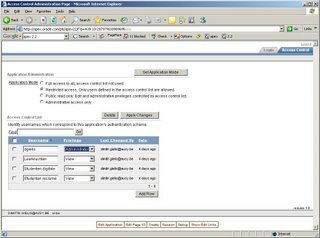 I started with the creation of four new 9.2.0.6 development databases, as all the old "database per application" will be merged into one of the four. On one of them I also installed APEX and I started creating a little application to replace all their Excel files and give them even more possibilities in a shorter time. As I also liked to do a clean-up of the databases I needed to ask the responsible persons what they still needed in the databases. 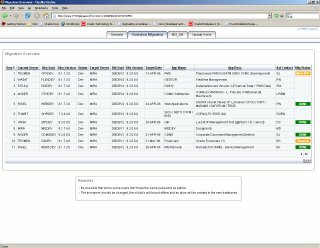 I created a dynamic script that searched all the info (which users, roles, tablespaces etc.) 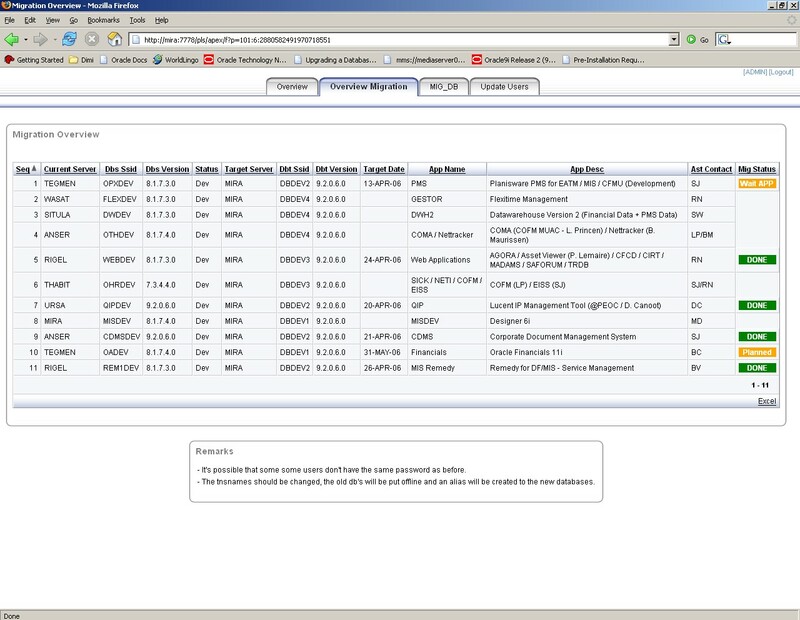 in the meta-data of the existing databases (via db-links) and stored it in some tables. Just with one click I had a complete overview of their environment! I could have used the Excel files they had, but where they up-to-date? Did they have all the information? Was it the latest version of the file? Who had which Excel file? 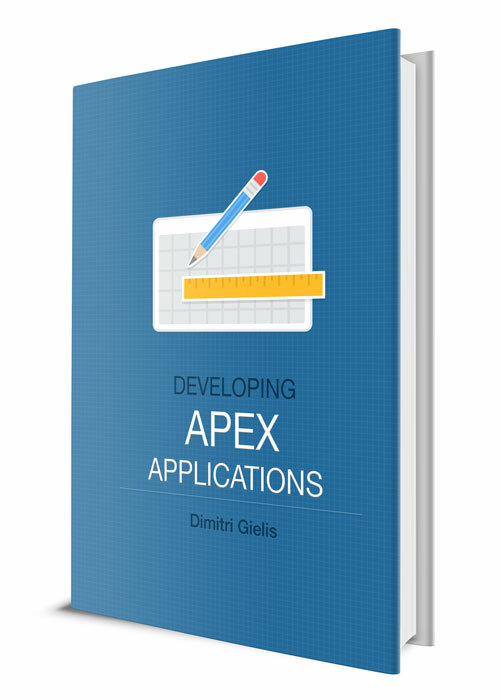 Next to the creation of this little application which is used by a lot of persons and management, I did some more to promote APEX. 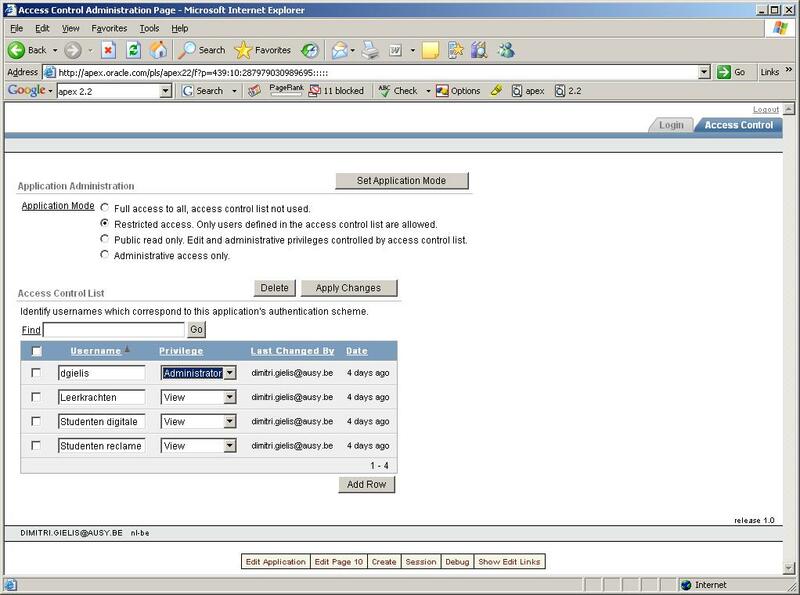 I started to give a little demo of APEX to two users, after a day, there was already somebody else asking me to show "that magical application"! The next day there were again some others... The word was spread just like that! 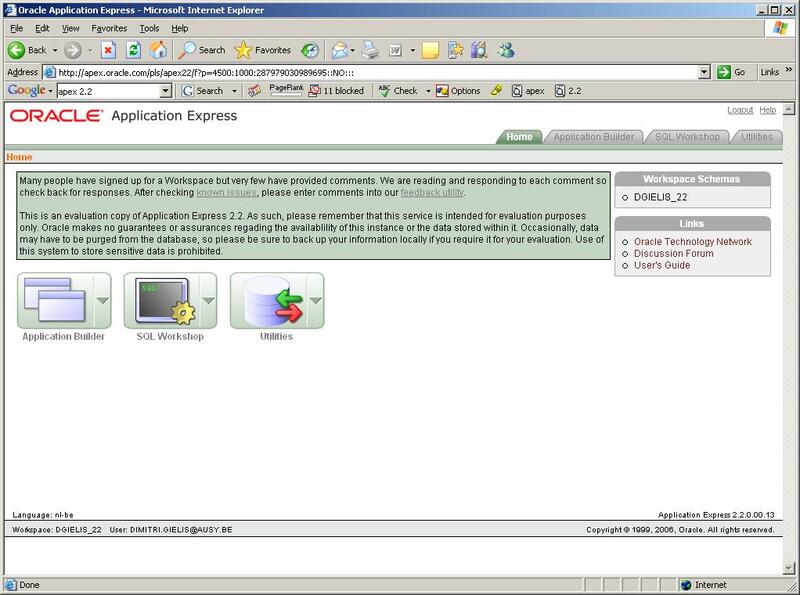 Today some people are even using APEX at home (together with Oracle XE)! It gives me a lot of satisfaction to see that. I think it's easy for you to do it too, so I thought to share this experience with you.